Posted in: Books. Tagged: decision-making, psychology. Well, this book has more than 2,000 reviews on Amazon, so I’m not sure what I’m going to add by writing another one, but here goes. 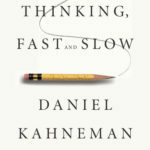 Thinking, Fast and Slow journeys through Daniel Kahneman‘s extensive work on the psychology of decision-making, its relation to economics, and the distorting effects of memory. The book is chockful of fascinating and, for me at least, reassuring insights into the human mind. According to Kahneman’s work, when it comes to decisions, our mind consists of two systems. One is good at drawing on past experience to continuously (and involuntarily) make quick evaluations but has pretty limited abilities when it comes to statistical inference or basic math. The other system is much better at complex evaluations but is lazy and usually just follows the input of the first system. The daily grind of thinking through complex problems for me feels like turning a rusty crank, so I was relieved to hear experimental psychology has revealed this to be a common struggle. After discussing the two systems, Kahneman describes his work displacing one of the central tenets of economics, utility theory developed by none other than Daniel Bernoulli, which assumes that humans are logical and rational. Kahneman’s (and many others’) work showed, in fact, we are prone to all sorts of misunderestimations. By way of illustration, what if you had a 100% chance to win $500,000 or a 98% chance to win $520,000? Bernoulli says you would pick the latter option. Finally, Kahneman covers his work on the disconnect between experiences and memories of experiences. Turns out that, when we recall a painful experience, the very last part of the experience can completely discolor the memory. One example discussed involved the pain experienced during colonoscopies (which took place during the 90s when these things still hurt a lot). Patients who had shorter colonoscopies that ended with a peak in pain described the experience as much worse than those who had longer, equally painful colonscopies but which ended with a tapering of the pain. Objectively, the latter group had a worse experience, but the tapering of pain made their memories less bad. This discrepancy has some interesting implications for what we mean by the word “happiness” — are we referring to satisfaction in the moment or contentment during reflection upon our memories? Kahneman has a neat TED talk on this topic. Kahneman illustrates many of the results with personal and experimental anecdotes, from the UCLA class that rated a course more highly after listing all its faults to the 1952 conference of economists who failed a basic test of economic rationality. One of the experiments appealed to me especially because it was something I could replicate. Apparently, your pupils dilate when you’re engaged in a challenging mental task — the more challenging, the more dilated. So I tried to see if that was true for me. Below is a gif of me staring into my iphone. The top panel shows my pupil as I thought about eating ice cream, the bottom as I multiplied 13 by 37 in my head. The bottom pupil is slightly but discernibly larger, about 1% larger on average. The only criticism I have of the book — Kahneman repeats himself a lot. Most of the important results are illustrated several times and from one chapter to the next. Maybe, as a psychologist, Kahneman believed that driving a point home required repetition, but I think the book could have been just as interesting with about half the pages. In any case, definitely worth the extended read to learn about the inner workings of your mind and maybe how to avoid common pitfalls in decision-making. So why is the second choice the rational one? With a 98% chance of winning $520,000, on average, you would win $509,600. If you had 100 chances to try this bet, it’s obvious which one you should choose, but it’s hard to convince yourself not to go for the sure thing with only one chance. That’s human psychology for you.